Internet speculation has been rampant this past year following the announcement that Verizon would not renew its sponsorship of the Indy Car Series after the end of the 2018 season. September became December and the calendar changed to 2019 with no announcement of a new series’ title replacement. But a recent trip to Japan by INDYCAR officials resulted in an announcement today as the 150-year-old Japanese global information technology and communication giant NTT was announced as the “multi-year” entitlement sponsor for the trending IndyCar Series. The announcement was made Tuesday in Detroit at the North American International Auto Show before hundreds of the world’s automotive industry elite. 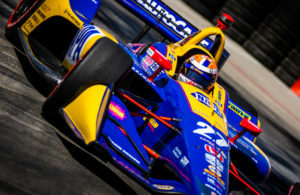 Mark Miles, CEO of Hulman & Company; owners of INDYCAR and the Indianapolis Motor Speedway, spoke of the upside the sponsorship would bring to the series beginning immediately. “Having a strong technology partner is critically important to Indy Car’s continued growth, so we are thrilled to welcome NTT as our new title sponsor,” Miles said in his opening remarks that announced the partnership. 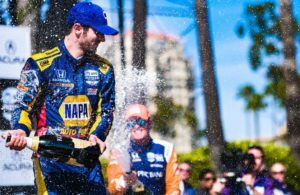 “Indy Car’s rise in popularity is a testament to the fact that we’ve made the sport accessible as possible to our fans, and we plan to continue in that mission,” he noted. Jun Sawada, president and CEO of NTT, spoke earlier in a release of the contribution that NTT (whose annual revenue is more than $110 Billion) can bring to the race series. “Technological innovations have the potential to change the sport and fan experience drastically. We will help to create the next generation of fans globally who aspire to enjoy racing through a more digital experience with INDYCAR,” also noting that NTT (Nippon Telegraph and Telephone) has been looking for more ways to become recognized in North America. Along with Miles, drivers Scott Dixon and Tony Kanaan, team owners Chip Ganassi and Bobby Rahal, and engine suppliers Jim Campbell (Chevrolet) and Art St. Cyr (Honda) spoke briefly before a large gathering of media. Ganassi is perhaps more familiar with NTT than the others, as his cars, driven by Tony Kanaan and more recently 2018 IndyCar Series champion Scott Dixon, have been sponsored since 2013 by NTT Data, the U.S.- based subsidiary of parent company NTT. 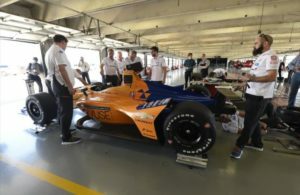 The sponsorship isn’t only for the IndyCar Series, but also includes becoming the official technology partners of INDYCAR, Indianapolis Motor Speedway and NASCAR’s Brickyard 400, all beginning in 2019. No word was given as to the actual length of the agreement, nor whether the sponsorship with Dixon’s car will continue long-term.